We are excited to actually be seeing real Hunger Games costumes this year. Previously we saw a few items here and there that we could turn into a costume. But now costume stores are actually making them almost identical to the ones in the movie! 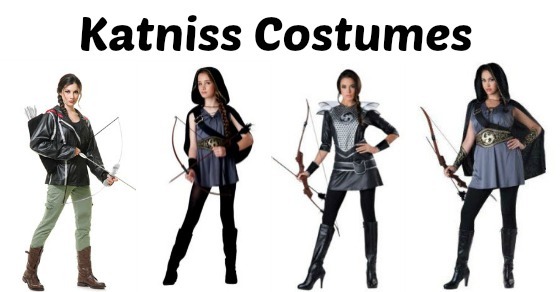 Description: Let the games begin with the Women’s Midnight Huntress Costume. Included in this set are a black dress, belt, satchel and black cuffs with lame trim. The faux leather mini dress has ¾ length sleeves, lame trim and layered epaulettes on the shoulder. The bodice features a silver mesh-type design. The belt and satchel are both black with lame trim. You will be a formidable hunter in this outfit. This versatile garb can be a part of a number of costumes. Leggings, toy bow, arrow and boots are not included but we have a number of complementing items in our accessories section. They also have this available in a Tween version. 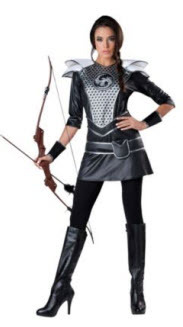 If you are looking for a different kids or Tween Katniss costume, they also have this one. Beware! It is selling out really fast because it is from last year. If you want it, you had better grab it! 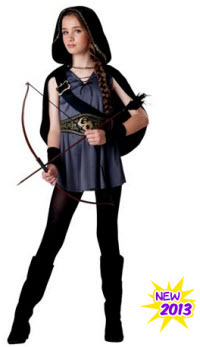 Description: Your daughter will love this Girl’s Tween Hooded Huntress Costume for her big upcoming Halloween party. This fun ensemble includes a hooded cape with a chain, tunic dress, and gauntlets. The tunic top is purple and features a lace up front and a printed on waist belt with gold detailing. Also included is a great hooded cape that contrasts in color and features a hood with gold detailing. Gauntlets for the wrists add a nice finishing touch. Don’t forget to browse through our accessories for toy weapons like a bow and arrow set and other great add on ideas. These come in tween sizes medium and large. 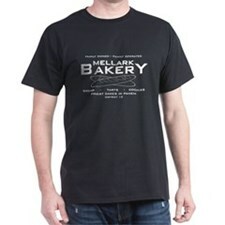 Looking for something in a size XXL or XXXL? BuyCostumes has you covered! Description: Grab your bows and arrows so you’re all ready for the attack when you surprise everyone this Halloween. 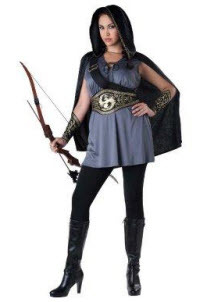 Show them who is boss when you wear this Huntress Dress – Womens Plus Size Costume, complete with a hooded cape, tunic dress with attached strap, gauntlets and belt. Black hooded cape makes you easy to hide from your prey so you are always ready for the kill. Gold trim on hood gives a feminine touch and chain across neckline gives a tough appearance. Tunic dress will have you feeling like you can take down any beast of the forest. Attached strap tells everyone you mean business. Description: Put your survival skills to the test in our Hunger Games inspired Women’s Black Archer Jacket. This sporty hooded jacket looks similar to the one that Katniss wears. It features white stripes and a red trim around the hood. Wear it with cargo pants and boots, and tie your hair into a braid for a similar appearance. This item is comfortable and is as great for everyday use as it is on Halloween. 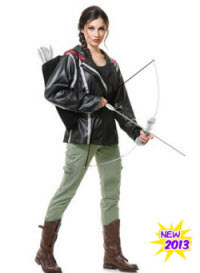 If you love this women’s archer jacket, get our bow and arrow toys to bring the whole look together. These come in small and medium, and you can also get everything else from them that you need to complete the look. You may find that not all of these are in stock right now, but they will be by Halloween. And we have a Costume Supercenter coupon that you can use! Get 10% off orders of $60 or more with code SUN10.